Set in a 19th century building in central Lyon, between the Rhône and the Saône rivers, this hotel is 350 metres from Hôtel de Ville Metro Station and 150 metres from the Museum of Fine Arts and offers free Wi-Fi access. The modern guest rooms at Hotel de Paris are colourful and individually decorated. They are serviced by a lift and include a TV and a private bathroom with a shower or a bathtub. Breakfast can be enjoyed every morning in the hotel's breakfast area or in the comfort of guest rooms. A wide range of restaurants, bars and cafés is found next to the hotel. Old Lyon and Lyon-Saint-Paul Train Station are just 500 metres from the hotel and Lyon Cathedral is 900 metres away. 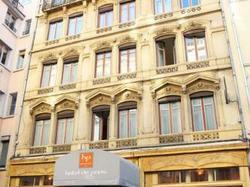 The hotel is 450 metres from Opéra Nouvel and 40 km from Lyon Saint Exupéry Airport. The rooms feature a colourful décor, free Wi-Fi access and a TV.